Weekends call for pizza. We all know this. So, what could be better than a discounted Domino’s gift card? The same great pizza, less money. What more can I say? With a menu including pizza, sandwiches, pasta, bread, salads, wings, and more, there is something for anybody. They also have a 30-minute guarantee that if your pizza isn’t at your door within a half an hour, then it’s free- which means the next time your starving beyond your wits, you can have your food within minutes of ordering it! To sum it up, use a discounted gift card, and you’ll spend less money! Founded in 1960, they are now the second-largest pizza chain in the United States. In fact, as of 2016, not only are there 858 locations nationwide, but they also have 82 restaurants worldwide- which means they are now world renowned for their pizza. Pretty impressive- and they’re even in Italy! Buy your discounted Domino’s gift card and use it at any US location. How about an Italian sausage & pepper oven-baked sandwich or a build your own pasta bowl? Sounds good, right? And did you know they have five crust styles from which to choose? They even have a gluten-free option! 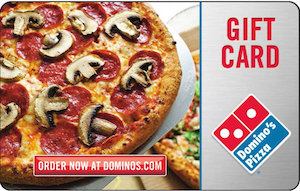 Buy your discounted Domino’s gift card and save money on your next pizza night. Combined with coupons and specials you can really save a lot of money! When you buy your Domino’s gift card, you’ll get more food for your money! But that’s not all! Cards2Cash offers lots of gift cards for other restaurants and stores you may know and love! Make sure you check out our listings for Pizza Hut, Ci Ci’s Pizza, Fazoli’s, Olive Garden and more! With Cards2Cash, you can eat the foods you love and still save money! Do you have a Domino’s gift card you aren’t going to use? Cards2Cash Buys gift cards and pays the highest percentage rate possible! We buy gift cards for restaurants, Clothes shops, hardware stores and more. Visit one of our retail locations for on the spot payment OR fill out our online form and we’ll get back to you with an offer for your card. Cards2Cash is your one- stop gift card shop!